▲ The GSC opened a press conference regarding the Gupabal shooting incident, demanding the truth to be told and an apology from the suspect. Last year on August 25th, Park Se-won, who was in the class of ’12 from the Department of Philosophy at Dongguk University, died in a shooting incident while he was serving in the military. Yet, the suspect, chief inspector Park Chul-geon, is still insisting that it was an unintended accident that happened while he was just playing around. The Ministry of Justice has charged the suspect with only negligent homicide during work, and even today does not admit his guilt in murder. Nonetheless, the family and friends of Park Se-won are demanding the Ministry of Justice to charge the suspect Park with felonious homicide. Park Se-won was shot by his superior, chief inspector Park Chul-geon, at Gupabal Soldiers and Police Joint Checkpoint affiliated to Seoul Eunpyeong Police Station, where he served his military duty. Live ammunition was fired when the suspect Park was aiming a gun at the people who were in the checkpoint, just for fun. After the gun was fired, the bullet penetrated the late Park’s left chest, and it eventually took his breath away while he was being evacuated to a hospital. In the first trial which was held on November 5th, 2015, the police detective charged the suspect Park with negligent homicide. Considering this, Park Se-won’s lawyer, Kim Yong-min said, “While it is natural to book the suspect on a charge of murder in the first time as it is a case in which a person was killed by another, from the first time, he was arrested on a charge of professional negligence resulting in death.” He mentioned that this has opened a great room for reduced criminal investigation. Moreover, the lawyer Kim said that the fact that the investigation was done in the control of Seoul Eunpyeong Police Station, which is a place where the incident happened, has made it extremely difficult for the fellow conscripted policemen to state about the incident freely. In the second trial held on January 1st, 2016, the prosecutor recommended a prison term of 12 years. However, in the next trial, which was opened on January 27th, the Ministry of Justice only accepted a negligent homicide charge and gave six years of prison, for there was lack of evidence to prove intentionality of murder. 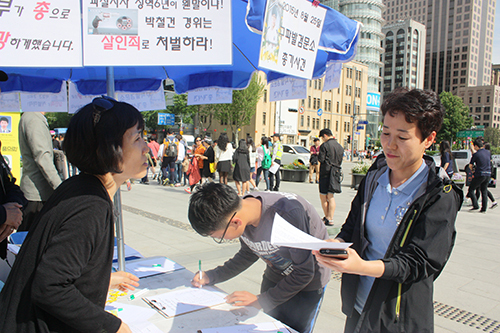 ▲ Park In-suk, mother of the late Park Se-won, is explaining about Gupabal shooting incident to a citizen in Gwanghwamun Square and asking to sign up for petitions. The family and friends of Park Se-won maintain that chief inspector Park should be charged with felonious homicide, not negligent homicide during work. Park In-suk, the mother of the late Park, said, “Not only was he a policeman with 27 years of career experiences, but he was also a first-class marksman, which makes it nonsense that he shot the gun unintentionally.” Moreover, the chief inspector Park tampered with the evidence by immediately removing all the ammunitions from the gun and rearranged them, leaving the late Park Se-won who was bleeding right in front of him. The lawyer Kim also explained that the chief inspector Park was fully aware of the fact that he was pointing a gun at Se-won. While the chief inspector Park was found to have been in a state of excitement at that moment, this was not because of anger but because of his feeling of ecstasy through harassing other people. The lawyer Kim noted that the suspect’s intention of murder was not in the victim but in the suspect himself for his own satisfaction. In addition, in the first and second investigations, the chief inspector Park claimed that he was carrying the gun after he had confirmed all the numbers and positions of ammunitions in the gun. However, he changed his words by saying that he actually had not known the exact state of ammunitions and he had lied because he was afraid that he might be punished even more if it turns out that he violated the rules in terms of gun usage. The lawyer Kim pointed out that this is an important point to prove the intention of murder as the time the suspect changed his statement coincide with the time he appointed a lawyer. Nevertheless, in a similar case in Canada, Robbie Fraser, a Canadian solider who accidentally shot his partner, Jeff Walsh to death, the court charged the shooter with murder. On their patrol in Afghanistan on August 9th, 2006, Fraser’s gun was discharged inside the vehicle on a bumpy road and caused the death of Walsh. Although Fraser’s did not have any intent of murder and the situation clearly proved that it was an accident, the court decided to sentence him with murder because accidental discharge of armory was an unacceptable error for a soldier and the public interest required prosecution. Meanwhile, the Gupabal shooting incident has revealed some loopholes in the Korean military. According to the Seoul Public Prosecutors’ Office control regulations regarding arms and ammunitions, workers in checkpoints made it a rule to separate the ammunitions from guns when carrying them. However, the chief inspector and other policemen were carrying their guns filled with live ammunitions at the time of the incident. Another control regulation mentions that the first bullet should be set with blanks, but in the gun which killed the late Park, the first bullet was live ammunition. Even more, the official document, which records the use of police guns, contained false information. 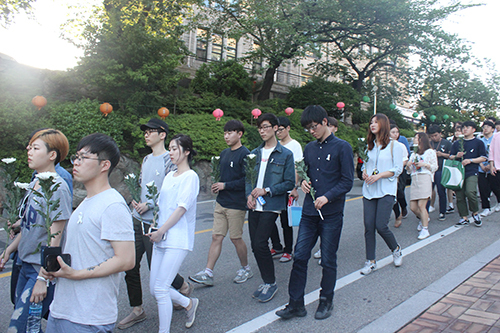 While it stated that the gun was deposited at 6:00 P.M., the incident happened at about 4:50 P.M.
▲ Donggukians are going around the school to cherish the late Park Se-won, each one holding a flower. Another professor from the Department of Law, Kim Sang-kyum, said, “The court works on the principal of legality. Therefore, regulations of duty and punishment of violation should be clear. For this case, there can be an internal disciplinary action, however, not much possibility of legal punishment. Internal disciplinary actions are always limited, thus, it is important to have a clearly stated crime policy.” Both professors mentioned education and internal inspection of those on duty as crucial for the prevention of such cases. Internal inspections should not consist only of filling out paper works, but be practical and conducted regularly. Classes regarding safety issues, bullying, and use of violence should also be held at regular times. The need for an inquiry into conscripted policemen’s rights has arisen as well. The family members of Park planned on the inquiry with civic groups. 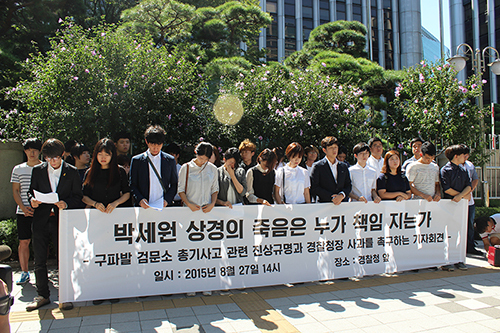 There was a movement with the Center for Military Human Rights Korea before the first trial. However, it was halted, for the family did not want the media to lose focus on the case itself. As of today, no action is taken yet but is in the process of planning. The need for civic groups to join the family over this case is not only to gain power but also to solve the problem in military from the root. The lawyer Kim mentioned, “Since it is difficult for an organization to revise its problems just through internal self-purification, the third party’s participation is essential to secure objectiveness and fairness.” He said that while the National Human Rights Commission of Korea is supposed to do this job, it has greatly lost its identity in the recent two governments.